Ernest Hemingway wrote his epic second novel, The Sun Also Rises, in 1926. It's a tragic love story that follows a group of American and English expats around the Left Bank of Paris to the macho bullfighting scene in Pamplona, Spain. As we're thinking about the state of bullfighting today on Fathom, we thought we'd take a minute to recall it's heady and glamorous novelization. "My God, isn't he beautiful?" Brett said. We were looking right down on him. "Look how he knows how to use his horns," I said. "He's got a left and a right just like a boxer." "Wait. There'll be another one in a minute." They had backed up another cage into the entrance. In the far corner a man, from behind one of the plank shelters, attracted the bull, and while the bull was facing away the gate was pulled up and a second bull came out into the corral. He charged straight for the steers and two men ran out from behind the planks and shouted, to turn him. He did not change his direction and the men shouted: "Hah! Hah! Toro!" and waved their arms; the two steers turned sideways to take the shock, and the bull drove into one of the steers. "Don't look," I said to Brett. She was watching, fascinated. "Fine," I said. "If it doesn't buck you." "I saw it," she said. "I saw him shift from his left to his right horn." The steer was down now, his neck stretched out, his head twisted, he lay the way he had fallen. Suddenly the bull left off and made for the other steer which had been standing at the far end, his head swinging, watching it all. 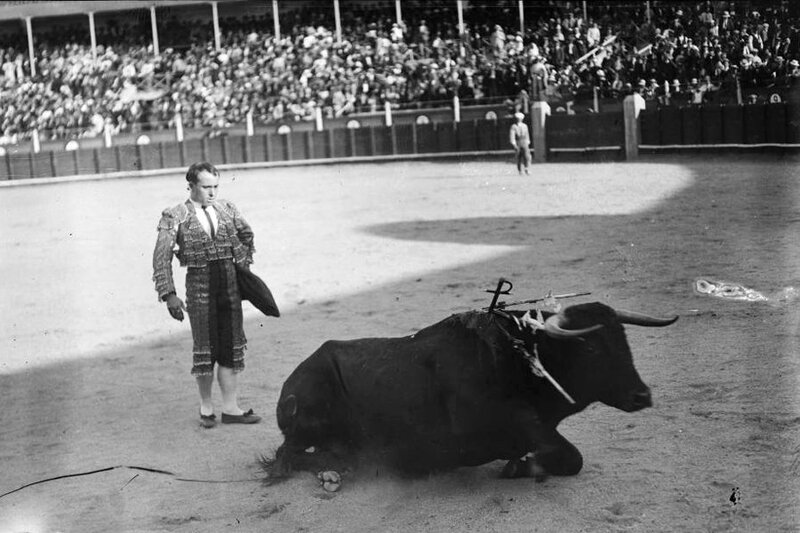 The steer ran awkwardly and the bull caught him, hooked him lightly in the flank, and then turned away and looked up at the crowd on the walls, his crest of muscle rising. The steer came up to him and made as though to nose at him and the bull hooked perfunctorily. The next time he nosed at the steer and then the two of them trotted over to the other bull.